Discussion in 'Hardware Mods' started by aaron9003, Jan 30, 2019. I recently bought a phat A01 and it came with 4.83. I realize that currently my only option is downgrading with Teensy. Can you point me to where I can download the required files to patch 4.83 and downgrade? Everything I’ve found so far is for lower firmwares if I’m not mistaken. firstly do you own a teensy 2.0++ ? do you have soldering skills? do you own have NAND Clip (if you don't have enough skills for soldering to mobo??? esc0rtd3w and aaron9003 like this. Use this for validating and patching your dumps, uses a 4.83 NoFSM Ferrox based patch to install 4.83 CFW straight after flashing the patched dump to the PS3. No need to downgrade unless of course you want to downgrade lol. 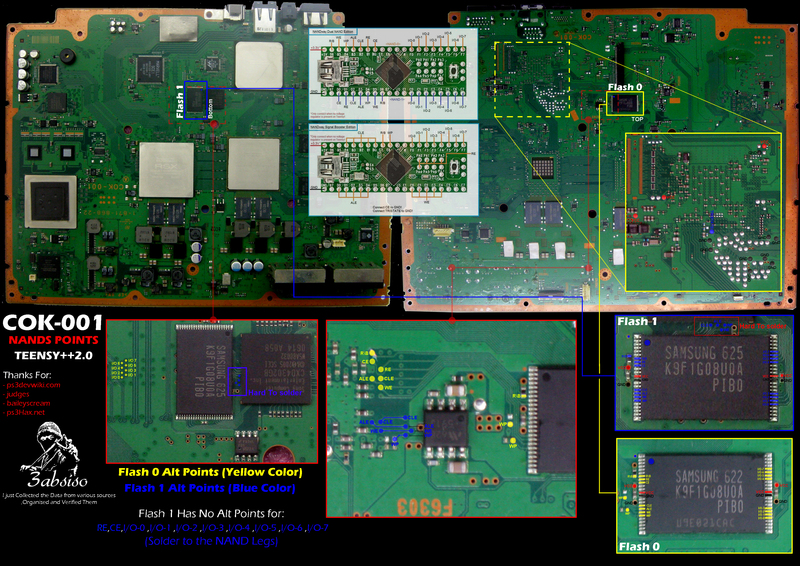 Make sure to validate your 1st dump, I would offer a step by step with a hardware flasher but I have never done this with a NAND PS3 and I believe they have 2 chips instead of NORs single one, or used a Teensey. Just NORs and E3 flashers, though if you look in the right places you will find a good guide to doing it. I do, I have a Teensy and the 3.3v regulator, and all the tools necessary. I don’t have a clip since it’s harder to find but I think I can manage the soldering, I opened up the PS3 and cleaned everything and looked at the places i need to solder to, they are unbelievably tiny but I think I can do it with a little patience. Oh wow! So this validates and patches the dump with 4.83 CFW? I would really appreciate it if you went into more detail on how to do this. I know that for NAND I’ll need to get two dumps, one from each NAND and merge them, then validate/verify, patch it or downgrade it, split it back up and then flash the separated patched dumps onto each NAND separately. So after I did this, do I just update to 4.83 Ferrox CFW? Oh wow! So this validates and patches the dump with 4.83 CFW? But yes after patching the dump (remember to back up your original dumps!!) and flashing it to the PS3 you can install Ferrox 4.83 CFW. After you have done this its a good idea to enable " QA Flags " this will allow you to freely install any CFW that is the minimum FW version of your PS3, eg. your min FW version is 2.70 you can install a 2.70 CFW if you really wanted to (no point going this low though lol), then go back to a later version anytime you wanted. As for the rest I am really no use here, I have not used this NAND Flasher, or soldered to the motherboard as my NOR Flasher has a clip. And I have never jailbroken a NAND PS3. You could have a look at this page for your flasher though I have not use this tut but the others linked to are good so I would think this is as well as i used the tut on here for NOR with an E3 Flasher. Be sure to read everything before you even start and double check everything. And remember once you flash the patched dump to the PS3, dump again and validate it before resetting the PS3 or you could brick your PS3. And if you are ever in doubt about something ask. esc0rtd3w, Algol and aaron9003 like this. I will definitely hit you up! I'm going to start soldering the Teensy now. Thank you SO much!! One is the "flux" liquid, is a chemical that allows the melted solder to attach better to the copper... think in it as some kind of "alloy fondant"
The other is the wire type... idealistically you need to use a wire with single core (and with the thickness indicated in wiki), usually this wires are named "wrapping wire" you are going to find a lot of wires announced with that name. In this group of "wsapping wyres" there is a famous brand that is the best named "kynar"
Thank you so much for taking the time to type this up. This is really helpful! Can you tell me how low the low temperature should be? I have a Hakko and can set it to any temperature but I don’t have a point of reference as to what the the safe temperature range for a ps3 motherboard is. I’m going to get some kynar, kapton tape and better flux paste and try my luck again. In the meantime I’m gonna read more into the masking technique as well. Again, really appreciate the help!! I finally managed to solder all the wires to NAND0 and connect the Teensy. I'm drawing power from a bench power supply (3.3v) which is attached to the teensy, both the Tristate point and CE are connected to GND on the teensy as well. I followed the NANDway Signal Booster Edition from this image. i checked my wiring at it seems fine, no shorts either. one thing i might be missing is the VCC and GND ponts on the NAND from this picture, do they need to be connected to the Teensy? btw, I cut the 5v trace on the teensy, soldered the two 3.3v traces and removed the 3.3v regulator since I am drawing power from my bench power supply. is that correct? I can't thank you enough for your help! as you can see in my previous comment i did manage to get the dumps but i got an error trying to verify it. do you know what could cause that error? do I have bad dumps? About 0xEF byte that should be 0xFF, it append sometime. It has no influence as long as you are sure you made proper dumps and you'll write using differential files to minimize risks to corrupt perconsole data. SKU id error may be due to refurbished console. nCadeRegal, esc0rtd3w and aaron9003 like this.